After an understandable lull in mid 2015 the Direct broadcasts got back underway on 12th November, with a presentation that included a mix of surprises, release dates and pleasing reveals. We then had Masahiro Sakurai's Final Video Presentation for Super Smash Bros. on 15th December which kept the momentum going. This Pokémon Direct shows that Nintendo is happy to continue with the franchise-specific approach seen in Sakurai-san's December presentation, for now at least. As for what the Pokémon Direct will feature, Nintendo has simply said it'll be a presentation "containing the latest on Pokémon games", while The Pokémon Company is hyping up "big news". Catch a new #PokemonDirect on 26/02 at 4pm CET! As always we'll be live streaming, blogging, chatting and then fully covering all of the Pokémon Direct festivities when they come. How hyped are you for the first Direct of 2016? Should be about Pokken, the Pikachu Mystery Game, a reaffirmation of the physical release of Pokemon Rumble, and then the announcement of Z. It's only going to be 5 mins, so not a lot. Really looking forward to see what we will get in the Pokémon Direct . A Nintendo Direct on my Birthday? Awesome! I just hope my delivery of Bravely Second doesn't arrive as I'm watching the direct. I'll admit, I'd have preferred it to be a non-specific direct, but I like Pokémon; I'm okay with a Pokémon Direct. I'm not that much into Pokemon, but watching Directs is always a pleasure. I'm expecting a reveal of a new character for pokken and the new game hopefully! Not hyped at all, but it's good to know the first NDirect of the year is Pokemon-centric. Some are saying it's only 5 minutes though, that can't be right ?_? Wish it was a regular ND but it'll do. I'm pretty hyped for pokemon since I got back into it with X. Anyway my expectations are that they'll announce Detective Pikachu for localization as well as announce Pokemon Z (which would as a result mean that metaldave guy is making up fake leaks). Pleaaaaaaaase tell us ALL your pokemon plans! I''m hoping we'll get something completely new and unexpected! But if it is only five minutes, I'm not expecting very much. @Grumblevolcano At this point I'm starting to worry we'll be waiting till the end of 'summer,' at least. How does Serebii know it's only going to be 5 minutes long? @teamshortcut You can do a lot for something like this in 5 minutes. but if true to me that's a big disappointment and should just be a regular ND with the pokemon announcement at the end. @Grumblevolcano 5 minutes and Pokémon focused, are we even counting this? I'm torn. Pokémon XZ -YZ did need to get out there, and they are keeping the ND name alive, so I guess that's a win, right? Maybe at the end they'll promote another ND for next week? If not, April 1 may become an annual tradition. For all the Pokémon fans out there worried about the short 5 minute length, don't be. Game freak knows how to promote their games. This is just liftoff for Z. There will be countless video and screenshots between now and release, this is basically just a teaser trailer, the real stuff starts later, maybe on Youtube, maybe on Twitch, it isn't the end, just the beginning. I'm not even a fan, but I'm happy for my kids. Pokemon Niji and pokemon detective game hype. 7th pokemon gen hype. Hype ,Hype, Hype! YES! We're getting a direct!...A 5-minute long direct, but still a direct! Franchise-exclusive and five minutes long? Meh. Won't even bother trying to watch it while at work. I know there are a lot of Pokemon fans out there. I'm not one of them. Sad that the first direct in an overdue long time, is dedicated to something we know comes out in a few weeks. How about giving us something to look forward to this year, outside the 3 or 4 big releases we know about. Ugh. Just five minutes will probably just be announcing Detective Pikachu and some last minute shilling of Pokken and Gen 1. Still, they really need to just announce Z or whatever is coming already. Everyone knows something of the sort is coming, just do it. 5 minutesn...Sooooooo just enough time for 1 Pokémon "Rainbow" Trailer. @starcatcher77 Not in EU, the release window is "2016". YYYYEEEESSSSSS!!!!! I just got a new phone, so I can finally watch Twitch streams reliably. And it's also being broadcast on an acceptable time in EU (not like 1 AM or something). In other words, MY BODY IS READY!!!! Eh, I won't watch this one. I'm sure you guys will report everything in it. I'm not that into Pokémon. A normal Direct would have been better. Danny Devito has been signed to contract! Rumor has it that it may only be 5 minutes long. Pokkén Tournament might be the first Pokémon spin-off that I buy in many, many years. So I'm keen to see a bit more of it. But 5 minutes long doesn't bode well, there's shouldn't be anything major revealed. Hm, I dunno. I'm not into Pokemon that much, but I guess I'll watch for curiosity sake. @Rob_mc_1 It isn't a rumor, if you go to the main site for the Directs it's listed there. So much for Fates I guess and I'll be just about ending school when the Direct starts. Looks like I'll be watching it on my phone whilst walking to the bus stop, 4G will save my life. We're getting a new game announcement. I'm excited to see what's in store! I can only hope for more Pokken fighters and a localization of Detective Pikachu. May I dream of Snap 2? A new main Pokemon game. Pokemon themes for 20th anniversary. @Serebii do you have any predictions? The latest word on the street is there'll be a generation 6.5 game, as a supposed list of new Pokemon that expand the Kalos Dex was "leaked". Either way, I'm just hoping for that next main entry title at last. My money is on Pokemon Z, but my predictions are usually wrong. @Grumblevolcano Typically I believe they have a Direct in the beginning of April, so I'm starting to think that's when we'll get the next general Direct. I know this because that's usually when they add a new console to the Virtual Console. XD (The DS and N64 last year, the GBA the year before). That thumbnail is perfect, lol. @Angelic_Lapras_King While true, that was always the 2nd main Direct of the year. 2015 had the first one in mid-January, 2013 and 2014 had the first one in mid-February, 2012 had the first one in late February. Really hoping to see hidden Pokken characters, expecting Pokemon Z, and happy either way! Good for the Pokemon fans but I need a full Direct in my life. I'm starving for some new reveals and I really hope they don't make us wait until E3. What's going on behind those closed doors Nintendo? Wow, Careful what you wish for. I think I said that I would like for a Pokemon Direct this month, and all sudden there is one! . TBH, i didn't think that we get one. im curious to know if they well do one for Pokemon next month. I guessed we'd get a Pokemon Direct! Though I had guessed one for Saturday, this is even better! This is so exciting! This could be anything! I'm hoping for a Pokemon Stadium type game on the Wii U. At least that's just a hope, I'd be happy with pretty much anything though. Five minutes? I'm not expecting much with that in mind, but I'm still excited. To be fair the announcement trailer for Pokemon X & Y was only about a minute and a half long. So they could certainly drop a lot of bombs in 5 minutes. Assuming they don't do some kind of anniversary intro trailer beforehand. aren't Five Mins, more of Nintendo Direct Micro/Mini? i feel like that for a Direct this would be longer, can't say 5 mins would be something to talk about on all things related to just Pokken Tournament and Pokemon Red & Blue. Disappointed it's not a regular Nintendo Direct but happy we're getting one at all even if it's Pokemon based. I just want the next main series game(s). I know a lot of people enjoy the spinoffs, but if isn't Snap, Stadium, or a main game, I'm not too interested lol. 4-5minute trailer of a new game. calling it now. Eh.......no thanks. I'd like a proper Direct please. I am guessing we will see the 3rd installment to the X/Y series, and then if it is not just focused on that here is what I hope to see. Confirmation that G/S/C will be on the 3DS eshop sometime this year. Pokemon Mystery Dungeon Red and Blue Rescue Team on Wii U virtual console in North America. 5 minutes huh? This will be interesting. A new (main franchise) game is all that needs to be revealed. 5 minutes should be more than enough for that. I'm ready for the Pokemon Z announcement!! I guess I'm a little disappointed. I wouldn't mind a 5-minute game-centric Direct normally, but I was really hoping for some Wii U news this year. I guess it seems things ARE winding down for the Wii U. That's how he knows. Don't believe a word he says. He's a renowned waffler amongst other things. @Sligeach Any news is better than no news. @GH05T that looks really good! @Sligeach Serebii is easily the most trusted/best source of pokemon news on the internet, I don't see how he's a waffler. If it's only 5 minutes I can see it being mainly talking about the past 20 years of Pokemon and ending with a 10 second teaser trailer for the 20th anniversary title that will be coming later this year. I can also see a lot of people being disappointed with the lack of content. Well, it's no Nintendo Direct, but I'm down with this! Maybe we'll finally find out what Amiibo do in Pokken! And when the English version of Detective Pikachu comes out! @Nicolai Don't be like that! Who said there wasn't going to be a general Nintendo Direct down the road? And who's to say we won't be surprised in this Direct? @Serebii I see you have a special freind up there, you waffler. I love the waffle on your website more than any other website. Keep up the good work, cheers. Japan's direct to at midnight, the exact start of the 20 year anniversary. That'd suggest a big announcement if you ask me. @EmmatheBest We already know how amiibo work in Pokken Tournament, it's identical to Hyrule Warriors support for non-Zelda amiibo. You get a random item or amount of money. Possibly about the rumoured pokemon rainbow? @EmmatheBest I think that's quite unlikely. Detective Pikachu is out already in Japan, and this is a worldwide Direct. I highly doubt it'll involve any game that we currently know of. It has to be about Danny DeVito! Pokemon Z....coming to iphone & android devices this summer! Either more info on Pokémon GO or a new portable game. If it's the latter, it is likely the much-speculated 'Pokémon Z' or really any version with a prominent role for Zygarde, including its various recently revealed forms. I'm expecting that complete form to be on th boxart. It could be something similar to Black and White 2, where it's a sequel to X and Y, or perhaps just a third edition to those games in the tradition of Pokémon Yellow. Whatever it is, I think this will be something big. Can't wait! if it is actually only 5 minutes: new handheld main series game (with trailer), mention of pokemon 20, maybe pikachu detective too for outside of japan. and then a tease for more to come later in march. 5 minutes? Ehh, that's just an extended trailer. Give us a real Nintendo Direct! @Vee_Flames: I suppose, but a general direct seems less likely to happen soon now. Any any rate, I hope we get to see Detective Pikachu for the west from this, even if it is unlikely. Well, they're probably going to announce a way to get Mew in RBY, since this Direct is before those games are released, followed by a trailer for PokéMon Z.
Gamestop is promoting Pokemo this Saturday 2/27. A few things are 20% off. I'm going to go off the rail with my guess. I believe this will be a 5 minute trailer for the "Pokemon 20th Anniversary Celebration" in general and will basically state that there are more big things coming for Pokemon fans throughout the year. But it will fail to actually show anything new. Colour me excited!! Fingers (and toes) crossed for the Pokémon Z announcement! since its ony 5 minutes its one of two things Pokemon Go or Z otherwise whats the point. Time for everyone to overhype this and then be disappointed that it didn't meet every single ridiculous expectation! Guys I hope they announce a new F-Zero in this Nintendo Direct! @starcatcher77 ...You can't be that stupid? It's out in Japan and the US, shockingly there are a few more countries in the world than that. @Grumblevolcano Announcing Pokemon Z does not mean SuperMetalDave is making up fake leaks. "Niji" is a codename. I hope we'll get something unexpected, but I think we all know we're just going to get confirmation of a Pokemon Z. @Captain_Gonru 30 seconds for Pokemiibo, 45 seconds for Pokken T., 60 seconds for Go - 30 for the game, 30 for the accessory, 9 seconds - 3 each - for red, green, yellow, the rest for XZ and YZ. Maybe 8 seconds for Rumble World on 3DS. Then 24 hours on Twitch. Gamefreak don't mess around. All together that's 5 more minutes than we've seen of Zelda U over the past 14 months. @Grumblevolcano Oh your in Europe, sorry. It's not a NINTENDO Direct.........It's a POKEMON direct!!! and 5mins is alittle too direct aswell (If it's 5mins long) I am wishing for a Fire Red/Leaf Green VC release that would rock my socks. @GH05T that's what I'm thinking too, 5 minutes is just long enough to show us some gameplay, new pokémon probably and that fabled final letter of the alphabet. Today's (Friday's) Pokemon Direct is brought you by the letter Z.
Pokemon Z- NX announced as first official game. Trust me, I know Shovely Joe from another site and he's absolutely full of it. Not to mention self-opinionated, obnoxious and rude. Thinks he's a know-it-all about everything but in fact knows very little outside of Pokemon. @Serebii My issue issue isn't with Pokemon. I don't care about that. It's all the general stuff about Nintendo you claim to know. Where's this secret Wii U game that you know about but still hasn't been revealed? Or how's about when you said NX had no chance of coming out before before 2018 but now you act like your prediction was 2016 all along. Nintendo is not keeping in contact with its customers. It seems to be lying low in the hope we do not notice, thinking no news is good news. I am sure that Pokemon folks will welcome news about Pokemon. .
Something us here in the West would like to know is when are we getting Fire Emblem Fates. That bit of news tagged on the end of the Pokemon news would be good. If they don't, I would question why they choose not to give this information. Nintendo with its limited product resources should try and keep its punters happy without winding them up. Right now they are winding us up. If it ends up being just about the games that they are releasing on the virtual console then I may not even watch this one since I don't have any real interest in those games. I can't see what else it could possibly be about considering the short length of the video. Awesome, looking forward to this! I don't finish work til 2:45pm but anything Pokemon related & I'm all for it. 5mins is enough time to cram a fair bit in but I do hope there'll be some news on a release date for Detective Pikachu for the West, a trailer on their next possible main entry or even a new ranger game. I'll take anything either way, can't say no to more pokemon goodness. "Nintendo is not keeping in contact with its customers. It seems to be lying low in the hope we do not notice, thinking no news is good news." Wow, with some people everything is a conspiracy of malice and incompetence. Or maybe they just aren't pandering to you enough? I wonder if these critics could ever be pleased? It seems that Nintendo think no news is good news. The first rule of sales is to look after the customers you have before looking for new ones. Nintendo act as though it's customers should be grateful for what Nintendo tell them or sell them. Since Nintendo is no longer a reliable company when it comes to delivering new games and it is selling mostly old stock at inflated prices, it would be nice to receive a monthly news letter to keep us up to date on things like a release date for Fire Emblem's UK release. 5 minutes? Sounds like a Pokemon Z announcement trailer. So excited either way. @zool - Sounds like you have a specific set of demands that you believe Nintendo must deliver unto you within a time frame you specify...only you don't specify. Because you feel entitled to have Nintendo read your mind, and adjust their business practices to that. The irony is that Nintendo is one of the more straightforward companies that deals directly with the public via directs, Nintendo minute, MiiVerse announcements, as well as the other avenues of social media. I get the feeling that there is no level of engagement that would be enough for you...or it would suddenly be "too much" and you'd have the reverse complaint of saturating us with too many announcements. Awesome! Hopefully this'll be the beginning of a full year of Pokemon celebration. Bring on Pokemon Z! Hmm, 5 minutes, though? A bit surprising, but we all should keep in mind that X & Y got announced in an 11 minute Direct, with most of it being a look back at the series. My predictions for this Direct: Pokken Tournament info, Detective Pikachu info, Pokemon Go info and release date and, the big one, Pokemon Z announced at the end of the Direct. Your use of Oshawott is very appropriate. Man, I think everyone has been wishing for Pokémon Snap 2. Ever since we laid eyes on the Wii-U's tablet controller. It seems like a complete no-brainer. Good grief! They could even have just done a HD remake of the original and added a couple extra areas and more Pokémon to snap and made use of the capabilities of the controller. 5...minutes....really? Maybe a knee jerk reaction to Pokémon Rainbow leaking. Don't care for Pokemon so I will skip this one. @Action51 if you thought that you would be wrong. I have not bought a game this year either for the 3ds or the Wii U. I have got the money to purchase lots of games but not the games to spend it on. I've been playing Paper Jam and stuff on my large screen top of the range smartphone. Yes games look good on the smartphone. I considered Xanoblade but did not get it. So I am waiting for something to spend my money on. News from Nintendo on a regular basis would be good. @Cloud02 @Calllack that would be awesome! I really, really hope it's not Pokémon Z. After they surprised everyone with Black and White 2 a few years ago when we were expecting Pokémon Grey, it would be kind of disappointing if they went with the obvious and predictable Z version. Still, I'm very excited to see a new Nintendo Direct, even if it is only 5 minutes long! Minute 1 - Welcome to Direct! I'm going to guess some Pokken information and the announcement for Pokémon Z, but who knows? There may be a surprise involved! Well, it's not like I'm not pumped. I just worry about the amount of gameplay footage we'll get. I've been looking to replace my pokemon X and Alpha Sapphire versions since I lost them this time last year. Some nice chunks of gameplay from a new game will be enough to tide me over till the end of the year. POKEMON RAINBOW AND DANNY DEVITO!!!!!! 5 Minute Direct? I'm gonna predict GameXplain will do a half hour pre-event discussion for it then, minimum. A quick peek at my weekend calendar and it appears I'll be hungover during this particular 5 minute window of a Direct. 5 min. long. We know there only going to be talking about The gameboy VCs. Doesn't look like much else. Well, I remember saying that if Nintendo were to do a Direct, it would be in early March, or it would need to be during the last week of this month. I guess the latter was right. However, I didn't expect it to be Pokemon specific. I wonder when/if there will be a zelda direct then seeing how its the 30th anniversary. @Rhydas We will probably get a new website launched with some content that didn't appear in the Direct and brand new info. "On February 27th (Saturday) from midnight, "Pokémon Direct 2016.2.27" will be broadcast. It will be a short video around 5 minutes, but for those interested, please tune in to watch." Or maybe Nintendo's Official Twitter account is just waffling again and we shouldn't believe a word it says. Please check your own facts before calling someone else out on theirs. @Spike6958 It was only a 15 minute discussion. This is almost certainly a new main game announcement. They don't do Pokemon Directs for nothing, it's always big news. I think it'll be a followup to XY in some way, but not a traditional Z, I'm predicting Gen 6.5. @Maxz You need to check the other comments. I apologise I wasn't clear in my first response. It's not about Pokemon, it's about his general behaviour and claims elsewhere. I myself provided a link that said the Pokemon Direct was 5 minutes long, as you say the information was there straight from the horses mouth, I had another source that's all. I know Serebii for years on another forum and I stand by my opinion of him. He should know very well who I am. He made a reply to me here afterwards but quickly deleted it, however, my e-mail notifications caught it. I'll save him the embarrassment of not repeating what he wrote. @Grumblevolcano Eh, still three times the length of the actual direct XD. Sceptile as the last, surprise DLC character for Super Smash Bros.
Big news in little time? Pokémon Z. @Spike6958 They speculated that maybe the NA and EU Directs could be slightly longer than the Japan confirmed 5 minutes because Japan already has Detective Pikachu. 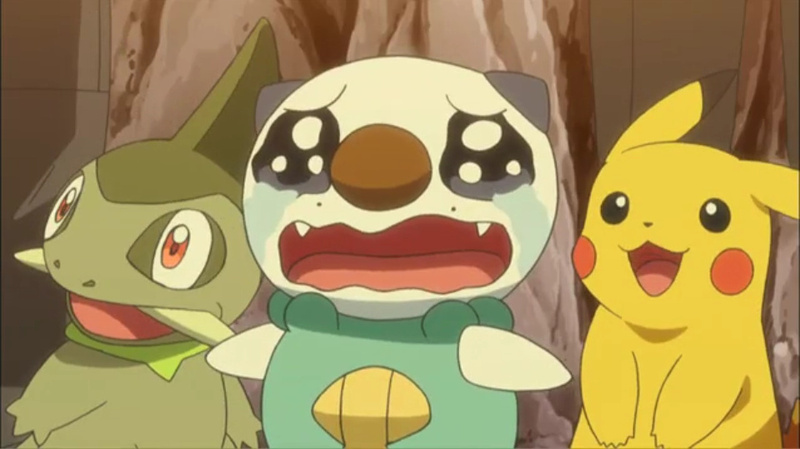 Oh... Oshawott. You were always one of my favorites from the show. In any case, it'll be a fun 5 minutes. At last; the long awaited Pokémon x Fire Emblem game will soon be announced. seeing as how the nintendo minute on the official channel is 10-20 minutes long, these five minutes could be a half hour to an hour long. Big Pokémon news hey? Sounds big! They should just show the opening to Z and then a release date. Boom Direct done...pokefans nosebleeding everywhere. @Calllack Just reacted to it I have a feeling these ones will be massive!